Shout out to Kerry Washington for her performance in "Django". she was spotted on the red carpet this weekend at the SAG awards. Jordan Sparks flaunting her slimmer figure at the SAG Awards, the color of this dress really compliments her complexion. Viola Davis and her husband was also on the red carpet, she kept it natural and it looks fab, she changed her hair color to a more neutral tone and it works better that the other copper looking color. From the Olympics to the SAG Awards Gabby Douglas has made strides and for all the haters out there, her hair looks fab. 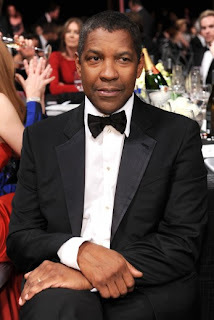 The man of the hour Denzel was in attendance he had a really huge movie last year "Flight".